One of my fondest childhood memories involves my mother digging the Halloween decorations out of the attic and decorating the house with all sorts of spooky (and goofy) decorations. Most of them were things we’d bought from the store, but there were a few that we took some time to make. For me, those homemade decorations were the best, and the DIY décor tradition is one that I’m looking forward to continuing now that I have a little one of my own. But figuring out which decorations to make can be tricky (and not in a “trick or treat” kind of way). If you’re working with kids and your craftiness skills are like mine – about a four on a scale of one to 10 – you’ll want to choose homemade decorations that are simple. You’ll also want to make things that are relatively inexpensive … so you can spend more money on candy! 1. Spider Webs – They don’t get much easier and more kid-friendly than this. To make spider webs , take cotton balls and stretch them apart. Then tape them to windows, walls or wherever you need a little extra spookiness. 2. Halloween Tissue Ghosts – kids have a ton of fun making these using lollipops ! 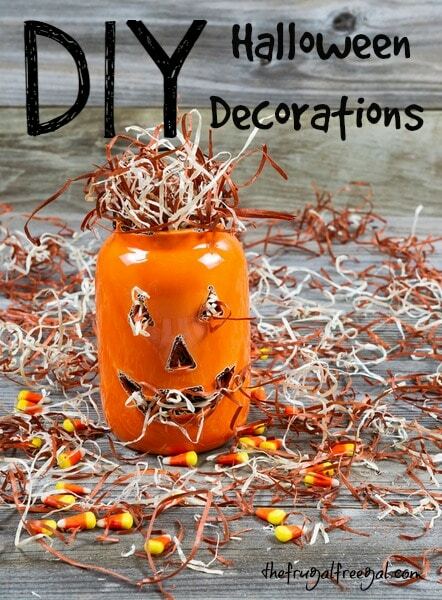 Display them with a pumpkin or stick them in styrofoam and set around your house for frugal decor. 3. Scarecrow – The scarecrow is fun because he (or she?) is a fun way to recycle old clothes and you can keep him in the front yard long after Halloween ends. Also nice: you can stuff him with leaves. Leaves your kids will gladly rake up in the front yard! 4. Scary Ghost Craft – fun and frugal for the kids to make. Perfect for setting on a bookshelf or stairway as decorations. 5. Giant Pumpkins – To make these oversized yard ornaments, simply take orange trash bags and stuff them with leaves (again, your kids will never be so eager to do yard work). Then use a black marker to draw a fun jack-o-lantern face. 6. Ghost – There are many ways to make a ghost, but this is among the easiest. To make this ghoul, turn a punch bowl upside down on a broomstick (you can also try a 2-liter bottle or milk jug) and drape it with a white sheet . Then draw a ghost face on with a marker, stick the broomstick in the yard, and watch the neighborhood kids run away in mock fear. 7. Mason Jar Jack-O-Lantern Use a glass mason jar to create a cute jack-o-lantern display. 8. 3D Halloween Ghosts – these scary ghosts are super simple to make using white cupcake liners to create a 3D effect! Do you make your own Halloween decor? What do you like to make? cute ideas! i always love DYI decorations..i think it stimulates imagination for kids and its amazing what you can come up with just using items around the house! thanks for these! i made some bat cut-outs and hung them with a string on my porch once. What great (and cheap) ideas! I really like the giant pumpkin and scarecrows b/c that gets the kiddies out of the house and involved in a little exercise! I love the mason jar and trash bag ideas. Thanks for the inspiration!